This is my first speech after the Icebreaker Speech. I chose to talk about “Tips for a Healthy Life” based on my experience of owning a health food store for 30 years. The purpose of this speech is to receive an evaluation (that would probably be more critical than the Icebreaker), take the comments and suggestions from the evaluation and incorporate them into the next speech. This speech was limited to 5-7 minutes. There’s nothing in conversation today that brings a greater diversity of opinions than politics, religion, and health. 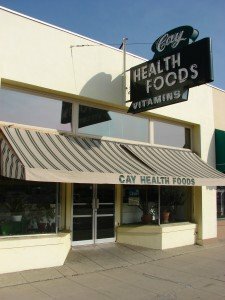 The first two topics I would not touch with a ten-foot pole, but I had the privilege of standing behind the counter of our downtown health food store for 30 years and I would like to share with you my 3 tips to a long, healthy life. Now, I’m not going to bore you with statistics of double-blind, randomized, meta-studies, or the latest research demonstrating coffee is good for you, no wait, it’s bad for you, hold on….what month is it? Yeah, I think it’s good for you now. As a proprietor, I learned about my customers’ families, work, and lifestyle. I saw many grow up, some grow old, and sadly, a few pass away. Customers became friends. I want to share their secrets of success. It was our first month owning the store. The previous owner, Bill, was working with us to learn the daily operations and introduce us to our clientele. We were near the front counter where we could see cars pull up to the curb when this cruise ship sized Buick comes rolling up. Bill looked at me and said, “This is Mr. Keister. He gets a case of Black Cherry Juice for his gout every month.” A big man, Mr. Keister, with an equally big smile, cast a shadow as he came through the door. “How’s everybody doing?” he bellowed. I would later learn Mr. Keister was 80 years old. He shopped at our store for 15 years and at 95, his eyesight was failing, but his smile and good cheer never wavered. It must’ve been around the third or fourth Christmas when one of my favorite customers, Libby, came in holding a large platter filled with all sorts of holiday treats. Libby was an excellent cook. At the time, I didn’t cook much. Many of the ingredients she used were purchased from our store. I asked Libby if she was worried about the sugar, fat, and calories in her treats. Eat wholesomely. It doesn’t have to be labeled organic. If it has a label, read the ingredients. If you can’t pronounce them, or if any have more than 10 letters, move along. Oh, and it’s “OK” to occasionally splurge. “Are you going to continue to smoke?” I said. Joe kept looking but he never found his answer in time. I believe we inherently know what’s good and bad for us. Be honest with yourself. Avoid those things that hamper your health and performance. Stay away from the dangers you know. People make health more complicated than it needs to be and you only have to look at the diet section of any bookstore to know that is true. Fit for Life Diet, The Hollywood Diet, The Adkins Diet, The Paleo Diet are guides that lead you away from, not to a healthier life. If I put a glass of water next to a diet coke, you know which one is better for you. If I put an apple next to chocolate cheesecake, you know which one is better for you. Am I saying NEVER have a diet coke? Never have cheesecake? Absolutely not! Those successful in maintaining health keep a mental ledger of good things and not-so-good things dealing with their body. The easiest plans are the simplest. Keep your health plan simple. Do the good things, avoid the bad and you’ll live a long healthy life.